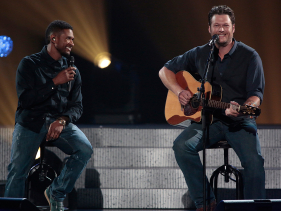 On any other night, when you see Usher and Blake Shelton sitting side-by-side the pair are exchanging friendly digs and teasing one another on "The Voice." that took the lives of 24 people in Oklahoma during the "Healing in the Heartland"
The show opened with ominous images of the F5 twister that all-but flattened the city of Moore and Shelton's performance of "God Gave Me You," which featured the lines, "But you stayed here beside me/Watch as the storm blows through/And I need you." Shelton, a native of Ada, Oklahoma, organized the one-hour concert benefiting the United Way of Central Oklahoma at the sold-out 14,000-capacity Chesapeake Energy Arena. The special aired on NBC, as well as CMT, Style, G4, Bravo, E! and Palladia. "I'm here tonight with some of my closest friends from Oklahoma and beyond to join in and help with the rebuilding and recovery of this land that means so much to me," he said. One of the night's highlights was an emotional performance of "The House That Built Me" by Shelton's wife, Miranda Lambert. The country star, whose mission was to raise awareness about the animals affected by the storm, was so overcome with emotion midway through that she began crying, prompting the audience to sing for her as she regained her composure. Shelton and Usher capped the night of touching tributes with a duet on Michael Bublé's "Home," which featured Shelton strumming an acoustic guitar. Usher, wearing jeans and a black shirt, sat alongside his "Voice" cohort and softly crooned the song as images of the storm's aftermath flashed on the screen behind the duo. "Man, is there anybody in the world cooler than Usher?" Shelton asked the crowd at one point. Also performing were Darius Rucker, Vince Gill, Rascal Flatts, Reba McEntire and Luke Bryan. Among the celebrities who taped messages of support were Oklahoma natives, Carrie Underwood, Garth Brooks and Trisha Yearwood, as well as Alicia Keys, Jimmy Fallon, Toby Keith and NASCAR champ Jimmie Johnson. Tulsa-bred OneRepublic singer Tedder sang one of the night's only uptempo tunes, a high-energy, countrified take on "Counting Stars" that was accompanied by a video of shooting stars that inspired some dancing in the aisles. To donate to the cause, call 1-800-890-4999, or text REBUILD to 52000 to make a $10 donation.